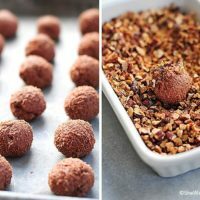 This Chocolate Cheesecake Truffles Recipe is so easy to make and it makes the perfect decadent sweet bite for any special occasion. During the holidays I always enjoy pulling out our family cookbook to search for goodies to share during parties and gatherings. Usually I’m looking for the recipes we’ve enjoyed regularly throughout the years, but every once and a while it’s fun to make a treat not on our regular list of goodies, like these Chocolate Cheesecake Truffles. 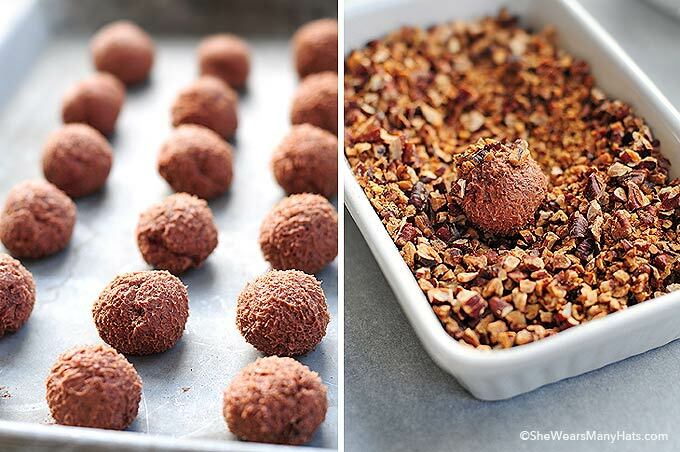 These truffles are so simple to make. And tasty? Oh yes. Yes indeed! 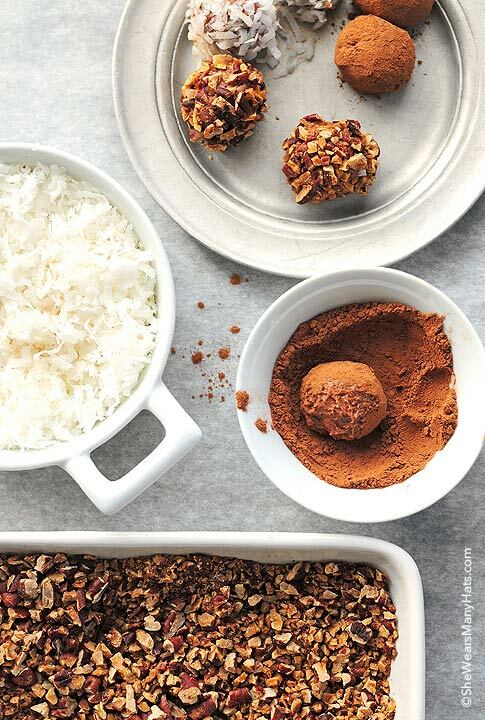 A basic combination of cream cheese, powdered sugar, melted chocolate, and vanilla are formed into balls, then rolled in chopped toasted pecans, other nuts, cocoa powder, shredded coconut or other coatings. By far our favorite coating was the toasted pecans. Aren’t slightly salty, toasted pecans just wonderful? It’s hard to beat their flavor. I supposed I could say that about any toasted nut. Anyway, try a toasted nut with these. Pistachios would be delicious too! Making the balls is a tad time consuming, but working with as a team would make for quick work and fun too! So set up an assembly line and find a helper if you can. For the coconut, I used regular sweetened flaked coconut, but next time, I’ll toast the coconut too. A combination of toasted pecans and toasted coconut would be delicious. Now we’re talking! These decadent little Chocolate Cheesecake Truffles can be made days ahead (not that they will last that long), and kept covered and refrigerated. Regardless, since these truffles are made with cream cheese, they will need to be kept covered and refrigerated until ready to serve. 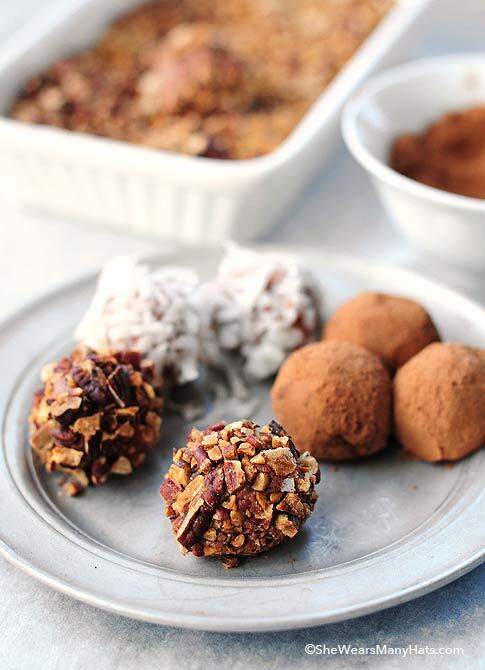 Decadent truffles that are easy to make right at home with a few simple ingredients. Perfect for parties! 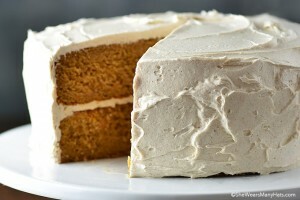 Using a mixer, slowly add powdered sugar to cream cheese mixing well after each addition. Add melted chocolate and vanilla and mix until smooth. Cover with plastic wrap and chill mixture in refrigerator for at least 4 hours. Shape into 1-inch balls. Return to refrigerator to chill more if mixture gets too soft to form balls. Originally published December 1, 2011. These look perfect!! I”d love them rolled in almonds. I have been missing out…I’ve never had a cheesecake truffle. They sound perfect. I love bite-sized anything. My husband would love them too! Oh Amy. Holy goodness, I’ll be craving these all day now! I am in love, these look so pretty and sound amazing! Oh my goodness yes please! There are so many different combinations that you could do with the little gems. Love the recipe. Those would last 2 seconds at my house. Le yum-o. oh i think I died and went to heaven!!!! these look SOOOOO good Amy! Oh my! Look at these beauties. Yes please! These look so decadent! Love the photography, Amy. 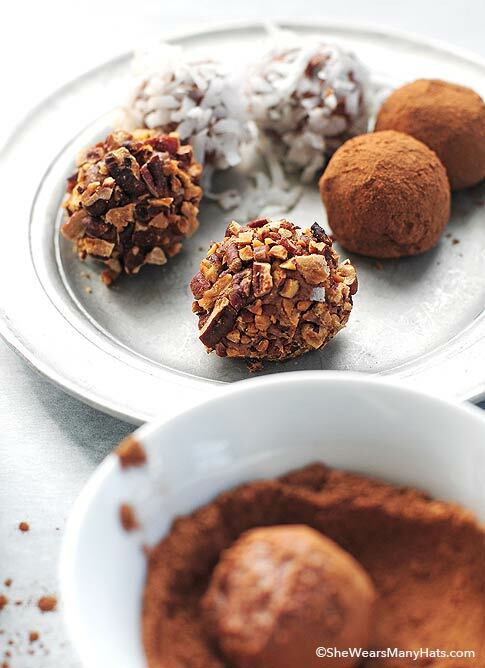 I love making truffles, and these babies are going on my list to make for the holidays! These look delicious and the photos are perfection!! These look divine! It look really easy to make them too. Adorable Christmas treats! Toasted pecans add a more festive flavor. Love the combination of choco and cheesecake. Truly a must try! . these truffles look really nice and your photography is amazing! Thumbs up! This looks decadent! Love the cocoa dusting. These look so scrumptious. I think I will need to make these this holiday season. Thank you for sharing, I am looking forward to making them! Love that it was so easy to print out! I can’t wait to try these. Thanks for sharing! oh my goodness! I am totally seeing these on the table at my cookie swap next week! Thanks for a great recipe! You have got to be kidding me. Chocolate + cheesecake = I eat all the truffles and my pants don’t fit. I’d be pleasantly plump. Seriously? These look delicious!! Amazing looking truffles! You’re spoiling us, Amy! These look too good to be true. Amy! You are so bad for my willpower. I MUST have these!!! And your pictures are gorgeous! oh my word, these look delicious! My brother would love these and I can’t wait to make them for him! These look like a great gift to make, will have to try them! I made these last night (New Year’s 2012). I really enjoyed the process, and knowing the possibilities of what I can roll these little devils in! However, even with the bittersweet chocolate they were incredibly sweet. Next time I may up the ratio of the cream cheese. Thank you for sharing the recipe! This is a keeper, especially since I can freeze what I will not eat right away. Cheesecake truffles! That sounds amazing! oooh! 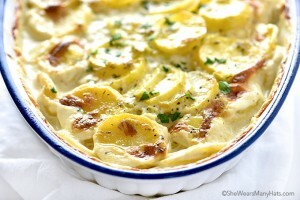 love the idea of these with the toasted coconut!